I wasn't really intending on going for a ride today but with the weather damn near perfect I couldn't really come up with a decent reason not to. So I decided that I would head off to Danniverke and then Weber before coming down Highway 52 and giving it a bit of a once over before the Capital 1000K Cruise next weekend. So off I went and took it pretty quietly through to Danniverke where I stopped for gas. When I pulled into the gas station there were a number of bikes gassing up including another Concours with a KTM Adventure for company. No idea who they were or where they were going as they took off before I could even say gidday. Back out on the road to Weber I got a little reminder to take it carefully when I saw a couple of fat lambs grazing on the side of the road. There were also 2 sets of road works to navigate before Weber. I wasn't the only one out as a group of Beemers with a little kwaka in tow went past going the other way. Leaving Weber and turning off onto 52 I started to get a few spits of rain - just enough to remind me that I should have cleaned my visor before leaving home. The road through to Pongaroa wasn't in too bad a condition but where it was wet it was also quite slippery. Leaving Pongaroa and still heading south on 52 I had to pass a huge tractor with dual wheels on who was taking up 95% of the road. The road through here isn't too bad although there is still a lot of repair work needing to be finished off. There is also places where the crappy repairs are getting broken up by the traffic. I stopped once briefly about 10km south of Pongaroa to take a quick piccy of the road condition before continuing on avoiding at least 3 more sheep and one large hare. 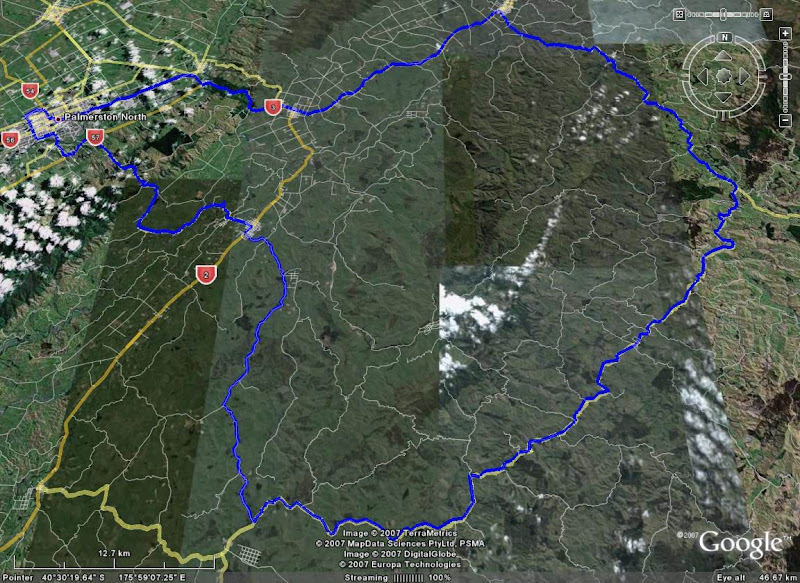 I finally turned off 52 onto Pa Valley Road to take me back into Pahiatua. Once in Pahiatua I stopped and had a quick bite to eat and say gidday to some riders that had come through from Hawkes Bay. A quick gouge over the track and then home. Action shot from the Grand Challenge - thanks Nadroj! After a week of absolutely rubbish weather it was nice to wake up to nice sunny Sunday morning. 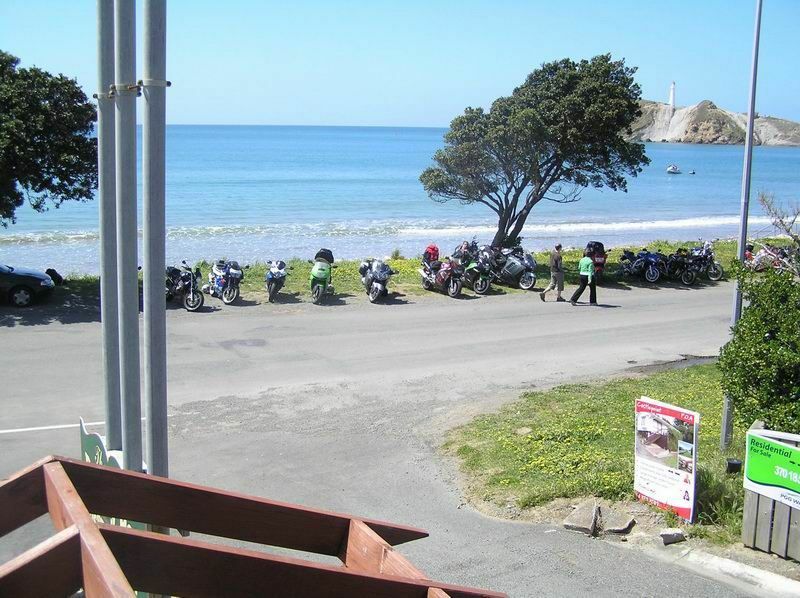 Even better was NZSarge had organised a ride out to Castle Point with riders meeting up in Pahiatua before heading out to the coast. 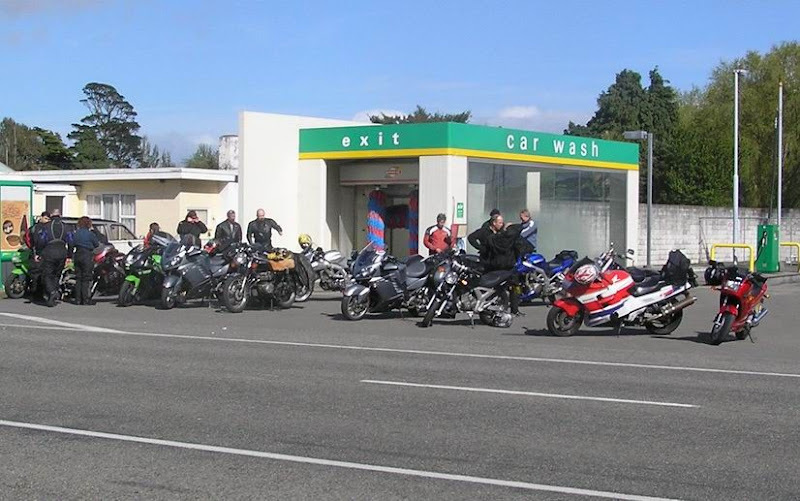 As there were a few riders leaving from Palmy and Shannon the idea was to meet up at the bottom of the Pahiatua Track before meeting the larger group in Pahiatua itself. A couple of learner riders were also coming on the ride and the plan was to take them quietly over the track so that they could get used to riding in a group of bikes. I was given the job of leading over the track and despite my best behaviour (80-90km/h top speed) broke away from some of the group. Although I was pleased to see one of the learners on her CBF250 sitting behind me so I didn't completely fail in my little job. Pretty soon we pottered on into Pahiatua where we met up with some of the Ashhurst crowd and a few up from Wellington. After wandering around and doing a bit of gas-bagging with still no sign of NZSarge it was decided to press on and hope that he wasn't too far away. The next stop to allow the group to reform was in Alfredton and a great place to get a picture of the two GTR's together. The roads through here are your typical back country roads that can't be travelled at light speed but do take you through some pretty nice country. 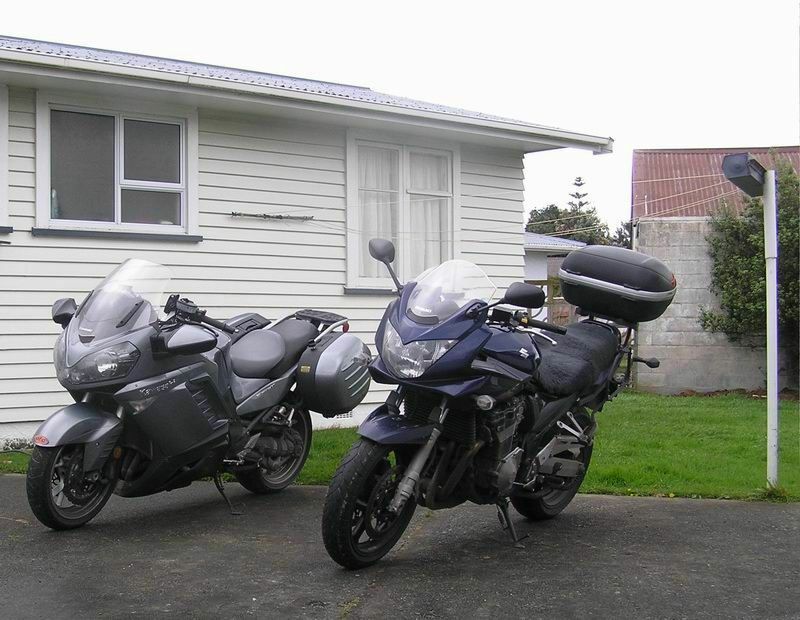 The two GTR's kept each other company through here and before long we were in Masterton where most people took the opportunity to top up there tanks before heading out to Castle Point. On the way out of town it was good to see the local cop booking a car as it meant that it was unlikely that we would see another one on the road. This was the first time I'd ridden this road and it's a cracker. I had a great time following a few others at a quicker pace through some really great roads. Once out at Castle Point it was time for a bite to eat and a bit of relaxing in the sun. The ride back took us again into Masterton where the little bikes topped up and we said seeya to some of the riders heading off in different directions. Once out on the main road we started to get a bit blown around as the wind had come up a bit. The pace was kept low to avoid tickets and to stay with the L-platers. We eventually turned off the main road to head through Mangamire and then onto the track. Very windy conditions coming over the track but the learners coped really well and when we stopped at the bottom of the track they were very happy at completing a reasonably long ride in the company of other riders. Good to see how keen they were and will hopefully catch up with them again on another ride. All in all, a great way to fill in a Sunday! Well the GC is over for another year. The weather was crap. I've finally got my website up and running so you can checkout the write up there. 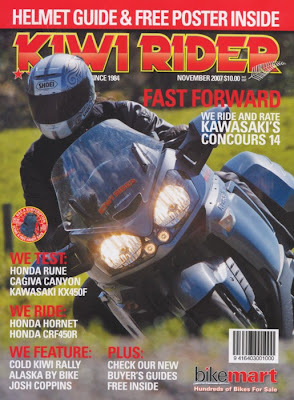 Seem to be getting a bit of a collection of mags with The Bike in them! Good to see that it got a good review. Will add more when I see them. So I've got this big fat tourer fitted with radial brakes and ABS but is ABS all it's cracked up to be? A lot of people have said things like "a good rider doesn't need ABS - their reactions are better and they can brake harder without ABS." Well I always doubted this and still believe that ABS is worth whatever premium the manufacturer charges for the option. But I've now had the ABS come on three times while riding the Concours and have good and bad experiences. Firstly the bad. Twice now I have come up to a corner and had the ABS come on when it shouldn't have and so increased my stopping/slowing distance. 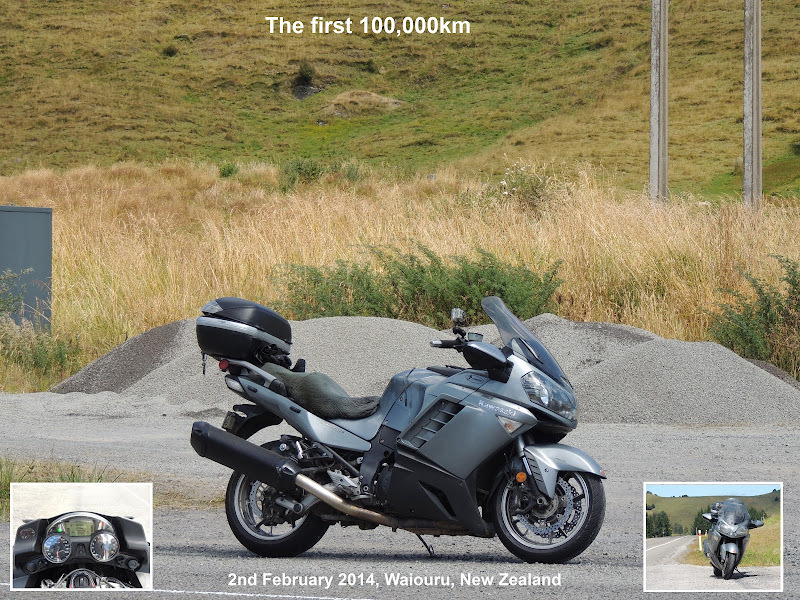 On both occasions this was on road surfaces that were very bumpy: the first time the road had lots of little bumps and the second time was on the Napier-Taupo road on a corner where there are actual judder bars in the braking zone (who's dumb idea was that?). What I believe happens is that the bumps may be enough to take a bit of weight off the front wheel and so allow the brake to slow it to a speed which is less than that of the rear wheel. The ABS computer thinks "heck the wheels locked, off with the anchors." Hence the increase in braking distance. 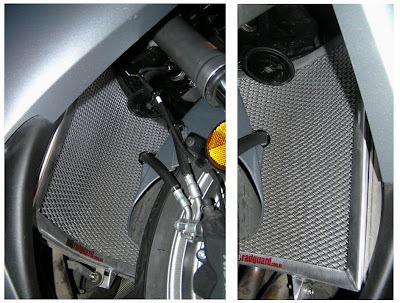 Repeated bumps only make matters worse with repeated activation/deactivation of the brakes. On the "judder bars" my braking only really happened once I was clear of the bumps and darn nearly into the corner. Not exactly "safe." But now for the good. On the Grand Challenge I had to hit the picks pretty hard on a wet road. The ABS kicked in but was very smooth in it's operation and braking performance was more than enough to slow me up for the corner. Excellent - I think that I may have been in trouble if the bike had the same monster brakes but no ABS to back them up. So, on the whole I think that ABS is definitely worth having especially on a heavy bike with awesome brakes - I don't think I'd like a bike with such powerful brakes and no ABS, it could be a recipe for disaster in the wet or if the rider is not paying attention. I think that they only way to get around the problem on bumpy roads is to aware of the problem and to be observant of the road conditions (as you should be anyway). On bumpy roads brake earlier and smoothly and be ready just in case the ABS kicks in. This is all just my opinion but I hope it at least informs you to some extent on the merits of ABS. You can tell I've had the day off and the weather is rubbish - have had time to do this write-up of the ride. Well, she's all over for another year. That's six in the bag for me now and this one must go down as one of the hardest and all because of the weather! Prior to leaving all the weather forecasts were saying that the North Island (particularly the West Coast) was going to be hit with rain and wind. And for once it was right - damn! After making really good time to the first checkpoint in Paeroa and heading into Auckland the weather changed for the worst. We got soaked on the motorway and pulled in to a gas station to put on wet weather gear where we a lot of guys were doing the same thing. We also ran into 1 of 3 riders who chucked it in due to the weather. Splish, splash up on up to checkpoint 2 in Dargaville and it was more of the same - wet riders gassing up. Most sill had a mile on their faces as they rode off into the now dark and wet. 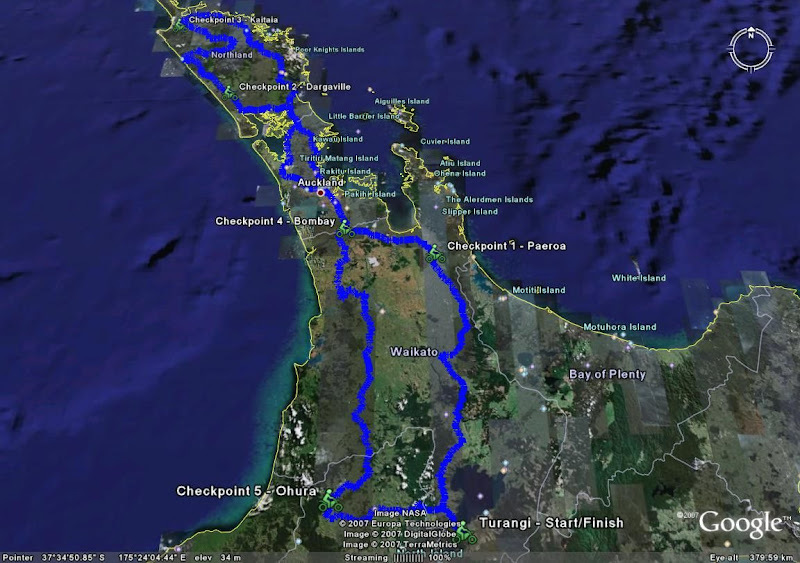 It was quite a mission riding on up to Kaitaia in the dark and wet and I took it very quietly. Just south of Opononi we came across a downed rider. He was okay and his mates waved us on - apparently he broke his collarbone but was able to be hitch a lift home on the back of someone else's bike. 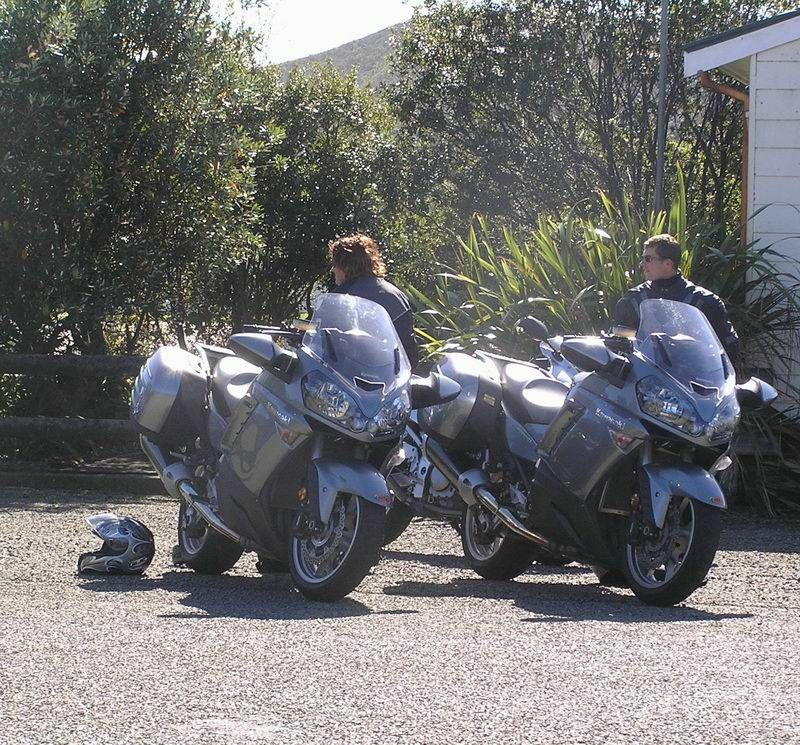 Pulling into the gas station at Kaitaia and there were a couple of cops checking out all the bikes - pretty friendly and I don't think they called their mates down the road to look out for us. Checkpoint 3 signed off and back into it. Our next stop was at Wellsford for gas where we wasted 10-15 mins waiting for the lady to try to turn the pumps on! Gave up as someone told us the one up the road was also open - doh! Finally gassed up and it was off through the winding roads to Helensville. It was here that I really started to feel a bit crook and had to stop a couple of times to take my helmet of and have a breather. On the motor way into Auckland and I was still feeling off so we stopped in at Drury for a decent break - my only coffee of the ride, a bit of grub and some panadol. Then it was just up the hill to Checkpoint 4 before heading out the back of Pukekohe on the way to Ngaruwahia for more gas. Back into it and now the wind had really come up to keep the rain company - the rain was now horizontal in places. At 8 mile junction we took Highway 4 and then turned off this onto Ohura Road. This was a real goat track and in the wet conditions - painfully slow. Never mind we hadn't come this far to make a mistake so we took it really carefully and eventually got into Ohura for the final checkpoint. From Ohura it was just a short ride back into Tamarunui and then over the hill to Turangi - but not before the weather could really chuck some rain at us. I'd look back in my mirrors and see Mark's Bandit throwing water out in all directions and he later said that it looked like I was hitting every puddle I saw when in reality the puddles were the road! I intend to write up something a bit more detailed for my website but in the meantime here's a pic of some dirty bikes and checkout a map of the ride here. Just a day to go until the start of the Grand Challenge. I've got today off and just have to organise a few things around home and wait for Mark to knock off work (1ish he thinks) before we're off to Turangi. Still looking forward to the ride anyway as it's been a year since the last one. Will be back home at some stage on Monday and will probably do a quick little post before doing a proper write-up for the website. Wish us luck...and clear skies! Radguard turned up yesterday so tonight was installation night. Wasn't too much hassle installing - only issue was lining up the bolt on the bottom mount but we got there in the end. Feel a bit happier having the Radiator protected from flying stones. All preparation is now complete for this years Grand Challenge. New tyres have been purchased, and the bike has had it's 24 000km service. Bike has been washed and accomodation booked, all that remains is to pack some gear and head out and do it! Well, we usually have one of these blogs before we head off. As Mark has mentioned, he's bought tyres and is getting his Bandit serviced this week. The Concours is pretty much ready to go although I've just ordered a Radguard from Aussie - hopefully it'll be here in time. After fitting that all I've got to do is clean & polish the bike, put some more protective tape on a few places (panniers etc) and then just load up & go!